Scott Pruitt got a reputation for stonewalling the press, but his successor is taking a new approach. In his first two weeks on the job, acting EPA Administrator Andrew Wheeler has promised transparency to the press and to the public. He has published his daily calendars, has agreed to interviews with a range of news outlets and gave advance notice that his meeting Monday with business officials in Pennsylvania would be open press. Such practices were commonplace for past EPA chiefs appointed by Republican and Democratic presidents alike, but Pruitt prioritized secrecy, preferring not to release his schedule until weeks later and releasing a private version of his calendar only under litigation. His staff screened for reporters they deemed favorable, and Pruitt rarely held open-press events. "We've seen some better access to mainstream and objective media since Wheeler came in," said Joseph Davis, director of the watchdog project at the Society of Environmental Journalists, an association that represents professional reporters. "SEJ was profoundly unhappy with the press operation under the Pruitt regime, and we can only hope that any changes will be improvements." A former Obama EPA press official said, "It's clear that Wheeler has brought a big mop and a lot of disinfectant to how the agency is working with the press. ... Night and day would be an understatement." Wheeler's press office says it is taking a new tack. Asked if more changes were coming, EPA spokesman John Konkus said that with Wheeler, "you can expect a change in approach, and in this case a change in tone, as well," noting that the acting chief has already said he puts "a premium on transparency. "I think you can take that mindset and apply it across the board when it comes to how EPA will be communicating with the media and the public going forward," Konkus said. Under Pruitt, EPA's press shop often adopted campaign-style tactics. Reporters weren't given advance notice of his events. Others were kept off an agency email press list. Some were even criticized by name for their coverage of EPA (Greenwire, Sept. 5). Aides also sought not to publicize Pruitt's whereabouts and to limit press access to the administrator. Jahan Wilcox, one of Pruitt's more vocal defenders, said in one text message that the EPA chief didn't want "open press" at an event. It also led to combative interactions with reporters, resulting in some choice quotes as Pruitt came under heavy scrutiny for allegations of excessive spending and mismanagement. One EPA spokeswoman, Liz Bowman, said in a story by The New York Times that the newspaper was writing "elitist clickbait." Wilcox directed an E&E News reporter to use Google when asked for comment for another story (Greenwire, May 15). Wilcox also garnered attention when he called a reporter at The Atlantic "a piece of trash," a comment he later apologized for. As frustration grew among reporters and press advocates, SEJ wrote a series of letters to EPA asking Pruitt to change his agency's tactics toward the media. But Davis of SEJ said the problems were broader than Pruitt and his staff. "We felt that this was in fact not just an EPA policy or a Pruitt policy; we felt that it was a Trump administration policy," he said. "Basically, the Pruitt press shop was imitating all the bad actions of the White House press operation. Gosh, we hope that changes, but it's still the Trump administration. Direct attacks on individual reporters, denial of access as retribution, selection of friendly reporters and preference given to them, preferential treatment of friendly reporters. Those things we would like to see stop." A former career EPA press official who worked under Republican and Democratic administrations said press management under Pruitt was "far from the norm that you would hope for." The "guiding principle during various periods when I was helping with press at the EPA was that we wanted more than anything to preserve our credibility, to get materials to reporters quickly, to try to be as helpful as possible, to try to serve the public's right to know," that person added. "The stuff that came out under Pruitt seemed to be exactly the opposite, that the press was somehow the enemy. ... There were even stories about reporters claiming to be physically restrained, things that were just really shocking and unimaginable." Some EPA press officials have left the agency, and Wheeler may bring in some new communications aides. When contacted by E&E News for this story, Wilcox confirmed that he has left EPA but declined to comment further. Others have left the press office, as well, including several in the aftermath of Pruitt's resignation. Along with Wilcox, Kelsi Daniell and Lincoln Ferguson are no longer working in EPA's public affairs shop. Bowman, who ran the office, left the agency this May. The political staff in the EPA press office has been depleted, but several staff members remain, including Konkus as deputy associate administrator for public affairs, as well as Michael Abboud, Molly Block and James Hewitt. Christopher Beach is also an EPA speechwriter based in the public affairs office. Still, EPA has not named an acting public affairs chief since Bowman's departure more than two months ago. Asked if the agency plans to name a press chief soon or staff up the office again, Konkus said, "We have no announcements at this time." Liz Purchia, a former head of EPA public affairs during the Obama administration, said having no set leader in the office can lead to chaos. "You don't have anyone to set the tone for the communications office in a leadership position with a communications plan in place," Purchia said. "Everyone can be doing their own thing and have to play whack-a-mole with reporters." Media experts and former EPA officials say secrecy at the agency has a tendency to backfire. "Clearly, Pruitt's strategy failed in terms of his engagement with the press," said the former Obama EPA press official. "The more Pruitt and his henchmen fought the press, the worse they did. They invited more scrutiny, which ultimately led to his downfall." "You have to feed the beast. If you don't make yourself available, reporters are going to pick and choose how to pursue their stories," Purchia said, noting how EPA under Pruitt went after journalists. "You didn't see a proactive plan of them trying to set the agenda." Bill Ruckelshaus, EPA's first administrator under President Nixon, was brought back in during the Reagan administration in an effort to rebuild the agency after it was tarnished by a Superfund scandal under Administrator Anne Gorsuch Burford in the 1980s. Like Pruitt, Burford was viewed at the time as being secretive and shutting out reporters. Ruckelshaus made an effort to be as transparent as possible when he came back. "You act like you're trying to hide something, people will go looking and they'll find something." He started holding regular on-the-record meetings with reporters. "To be honest with you, some of them didn't like it so much, because they lost their ability to break a new story. Everybody got it at the same time. But I think it's absolutely necessary to do that," he said. Reporters who had swarmed EPA to cover the Burford scandals lost interest pretty quickly, Ruckelshaus said. "It doesn't take long if they see that you're trying to be as open as you can be with them," he said. From the perspective of journalists looking for news, EPA became a less exciting place to work. Wheeler, a former Capitol Hill staffer, has a track record of regularly talking to the press. "I think a lot of people give Andrew credit for his outreach to media," said Matt Dempsey, who was a press aide to the Senate Environment and Public Works Committee under Sen. Jim Inhofe (R-Okla.) when Wheeler was staff director. Wheeler started doing pre-hearing briefings with reporters ahead of hearings and committee votes, Dempsey said. And under Wheeler's direction, Inhofe's press office was credited in 2007 with having the first-ever live Senate blog during the State of the Union address. In 2008, Inhofe's website won an award from the Congressional Management Foundation. In a statement about the award, Inhofe touted the website as a way to bypass the media. "Creating a top-notch Committee website provides the public more direct information — in many cases by bypassing and critiquing the mainstream media — and greater access to their elected representatives," Inhofe said then in a statement. "The goal of my website has always been to bring our government closer to the people and allows for more feedback from our constituents." But Dempsey said Wheeler sees value in working with reporters from a range of news organizations. "One of his strengths is working with the various media outlets and working across the spectrum," Dempsey said. 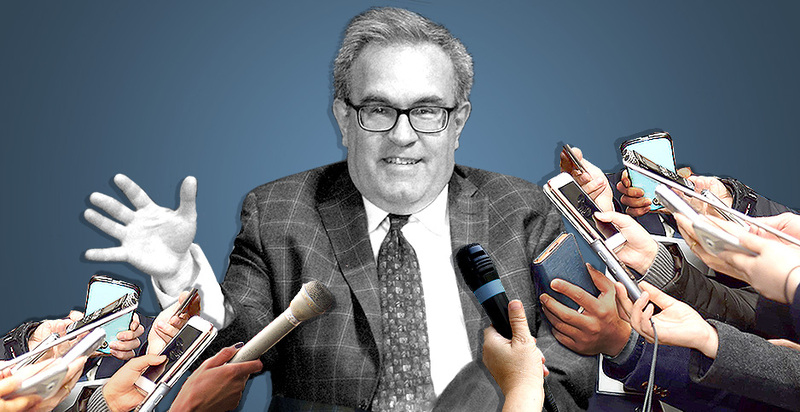 Wheeler's early moves to open up press access at EPA have been greeted with optimism by some of those who criticized Pruitt's approach. Yesterday, Sen. Tom Udall (D-N.M.), ranking member on the Senate Appropriations subcommittee with jurisdiction over EPA's spending, sent a letter to Wheeler in which he recounted that the acting EPA chief had pledged in a phone call to publish his daily schedule after the end of each day and announce events for press in advance. Udall welcomed those actions but pushed for more change at EPA. "While I welcome these steps, the job of re-establishing trust with the American people will require more than simply publishing a public schedule and abiding by the appropriations process," Udall said. Critics of the Trump administration are waiting to see what Wheeler does next. "The important test will come when there's a crisis, when there's strong political opposition and when there's something they don't want the world to know about, and that's when the rubber meets the road," said Davis of SEJ. Purchia said of Wheeler, "The bar is so low that anything they will do will be a major improvement." Still, she added, "no one should be celebrating that they are doing the bare minimum."